The Bowling Green Inn on the corner of Eanam and Syke St. 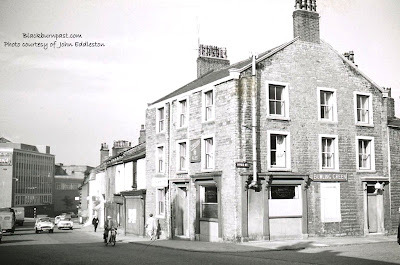 The pub probably takes its name from a bowling green that was once on Cicely Hill. In fact I think it was where the Blackburn Subscription Bowling Club was based before they moved to the bottom of Shear Bank Rd (based at the green I mean, not based at the pub). Next door to the pub, just lower down, is the premises of what was a pawn shop, where in February 1960, 56 year old pawnbroker Frederick Bridgewater Gallagher was murdered by 25 year old Hungarian refugee Milhaly Polce. Polce was traced after he sold a yellow banded wristwatch (which he had taken from the body of Mr Gallagher) in South Wales. He was sentenced to death for his crime in June 1960, but this was later commuted to life imprisonment. Murder info courtesy of Christine Wilks. Is that New looking building at the left of the photo Dutton's brewery at the corner of Salford and High St? It most certainly is BTS. And that light coloured sign you can see sticking out, on the same side of the road as The Bowling Green, down where the cars are, is (I think) the sign on The Veteran pub.